Meet the Coaches Night was held Monday, November 26 at Windham High School. 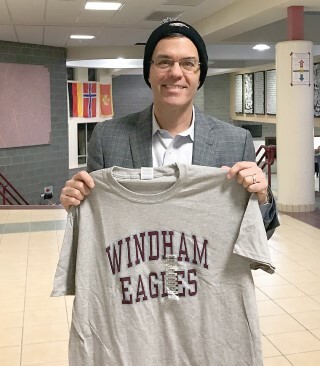 The evening included the keynote speaker, Tom Caron as well as coaches from the Windham Middle and High Schools, providing parents the opportunity to meet with their child’s coach and learn more about the sports season. Athletic Director Rich Drummond began the evening by stating the number one goal of the athletic department was to improve communication. Shelly Afthim, head of the Windham/Raymond Booster Program also spoke during the event, explaining the benefits of involvement with the program and that they are one team with one goal for every sport. Caron, a Lewiston High graduate and NESN sportscaster, took the podium to expound the importance of being on a team and what that means. He illustrated the triangle approach with sports; with one side of the triangle representing parents, one side as the coaches and the third side, the athletes. “If each side is working together, it makes for a smoother season,” Caron stated. Caron shared with the athletes and their parents regarding the road that took him to NESN. When he graduated from high school, Caron’s goal was to work for a newspaper as a sportswriter. He went to St. Michael’s College in Vermont and during his junior year, he received an internship at a television station. He fell in love right away with the teamwork aspect of working at the studio and thus his life began as a sportscaster. Caron’s interest in sports stems largely from his dad, who was a huge sports fan and a great baseball player. Caron stated it was clear he wasn’t going to play a sport for a living, but he believes if you love something, try to find a career in that area of interest. “I never thought it’d be a lifelong thing, but I got the internship and that station hired me out of college” he said. He worked for television station WGME as a sports anchor and station WPXT as a sports reporter. In 1993, he was looking to move away from TV and took a job doing play-by-play calls for Maine’s Portland Pirates hockey team. Although Caron says he was tired of TV, he fell in love with doing play-by-play and after two years with the Pirates, NESN took notice of him and offered him a job. Caron’s wife is also from Lewiston and they have a son who is a senior at Saint Michael’s College in Vermont and a son who is at Bridgton Academy, looking to play soccer next year in college. “I’m a Mainer, I’m proud of it and that’s never going to change,” he exclaimed. Good luck to all athletes during the winter season!